Location: Larnagol, in the Meurthe-et-Moselle departement of France (Lorraine Region). Notes: The castle of Larnagol is a castle located in Larnagol, France.Before 1624, Charles de Cazilhac, Baron de Cessac became Viscount of Larnagol and Calvignac. His son, Francois de Cazilhac, sold the land of Larnagol on December 11, 1638, with a ruined castle, to Pierre de Laporte, 1 belonging to an old family of magistrates of Figeac. In 1667, Pierre de Laporte, lieutenant general civil and criminal of the seneschals, counts for the barony of Larnagol, with "two very old and ruined chasales located in the place of Larnagol with stable and patus, common oven and port, On the Lot, etc. ". The primitive castle is the "superior" castle. The new castle is the "lower" castle. The Laporte kept the seigniory of Larnagol until the Revolution. They completely transformed the buildings from the lower terrace of the place. Jean de Laporte, the grandson of Pierre Laporte, began construction of a new castle between 1705 and 1729. The work of the new or "inferior" castle was directed by the master mason François Fortier from 1712, Reconstruction of the original dwelling, and built the monumental staircase ramp-on-ramp that serves the floors. After 1729, his son, Étienne-Alexandre de Laporte, continued and completed construction in the 1780s. He bought for 67 books, between 1768 and 1771, balusters and columns of the castle of Saint-Sulpice. The stucco Regency decor on the second floor was executed by the Italian stucco designer Marc Orsini. The "superior" castle became the dependenciesIn the nineteenth century the castle belonged to Louis-Victor Benech, then to the Sirand, then to Antoine Bonhomme in 1869. The whole castle is divided with the acquisition in 1870 of the castle "superior" by the municipality which plans to install there schools and offices of the town hall. 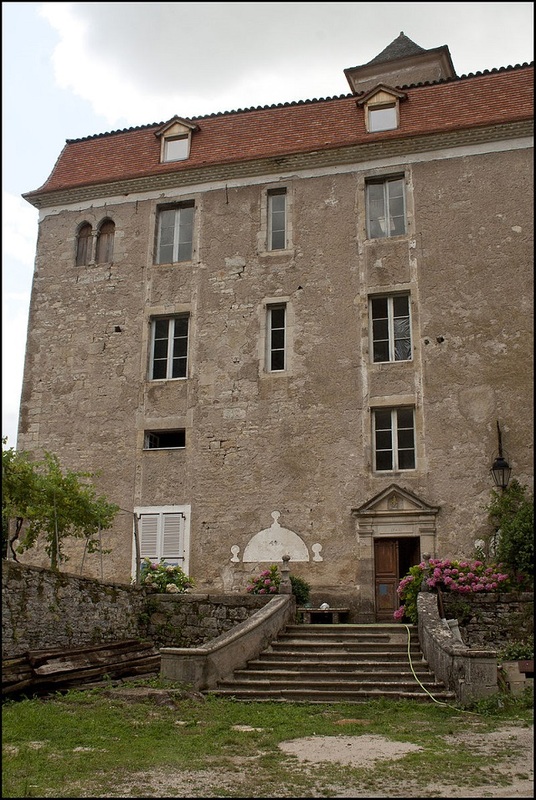 The "inferior" castle became the property of Saint-Chamarand, then the Gimberge, a family of local wine-growers until its purchase in 1924 by the Parisian ironworker Raymond Subes. From the medieval castrum of Larnagol remains in the "superior" castle, the remnants of a masonry which could be from the eleventh century, the base of a flat buttress tower, perhaps from the twelfth century or the thirteenth century, encompassed in a Reconstruction of the end of the thirteenth century or of the fourteenth century. In the "lower" castle, it is preserved in one of the elevations of a two-storey building of the geminated bays, dating from the end of the thirteenth century or the fourteenth century, whose capitals are similar to those of Cavaniès. A square belfry of the fifteenth century is leaned against the house. The building is listed as historic monuments on May 25, 2001.